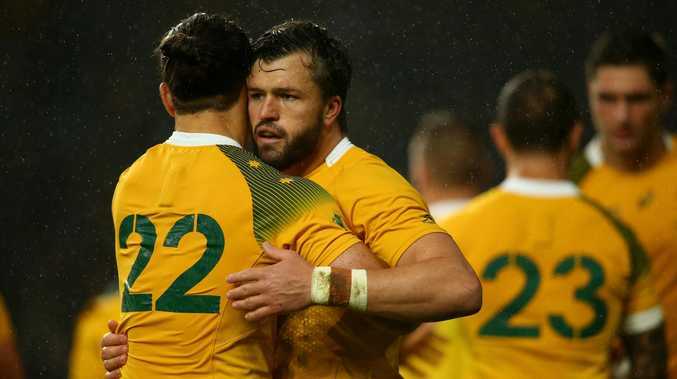 Adam Ashley-Cooper of Australia celebrates with Matt Toomua. MATT Toomua has welcomed returning veteran Adam Ashley-Cooper's competition as much as his guidance in the Wallabies backline, a year out from the World Cup. The experienced midfield duo are restored to the Wallabies fold this week as part of a 33-man group training in Japan before the three-Test tour of Europe. Versatile back Toomua missed last weekend's loss to the All Blacks because of his commitments at English club Leicester while 116 Test veteran Ashley-Cooper and uncapped Queensland Reds teenager Jordan Petaia have been called in after injuries to Tevita Kuridrani and Reece Hodge. Toomua joked that he was "wondering what was going on" when first seeing Ashley-Cooper at the Odawara camp, more than two years after the veteran last represented Australia. However, Toomua was deadly serious when assessing what value his former Brumbies teammate could bring, particularly now that his stated goal was to play at a fourth World Cup. "Obviously it's added experience and, mixed with a guy like Jordie, it's a nice little balance and I think it's good for us," Toomua said. "We need some competition in those back spots to push guys and to deliver better performances. "Having a guy like Adam here really helps. "He's in great nick as well." 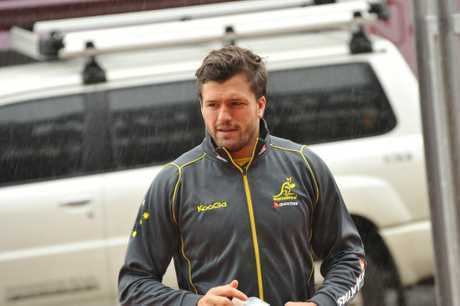 Japan-based Ashley-Cooper is negotiating a Super Rugby contract at the NSW Waratahs next year. The third most capped Wallabies player will be well past his 35th birthday when Japan stages the World Cup next September. In his favour, the All Blacks who beat Australia in the 2015 tournament decider featured a midfield of 34-year-old Conrad Smith and 33-year-old Ma'a Nonu. Former Wallabies great Tim Horan said the experience of Ashley-Cooper can't be underrated, particularly building up to Tests. "I just think the team probably needs that bit more leadership and experience around them, even if he doesn't play a Test match while he's away," Horan said. Meanwhile, Toomua said he was impressed by the facilities and level of local support for the Wallabies in Odawara, a city 70km southwest of Tokyo which will be used as the Australian national team's base during the World Cup. He believed no stone had been unturned in making it the ideal place to relax and train. "It's great but it just means there's a lot of responsibility for us, to deliver some performances," he said.